Even the “best” phone available, equipped with all the bells and whistles one may desire, is rendered useless without a charged battery. We rely on our phones to be useful and productive and we become frustrated if our batteries are failing or dying too quickly. Car batteries are no different. A car without a working battery will take you nowhere fast. This can be especially disheartening in the bone-chilling winter months in Alberta where you might bundle up on a frosty morning (or post-work day) to find that your car battery is dead. Fortunately, if you are informed and knowledgeable about your car battery, you can prepare yourself to avoid a dead battery, and be self-sufficient when roadside assistance (e.g., AMA) is asserting a wait of up to 48 hours or there’s nobody around to help you out. So here are 5 Tips for car Battery Maintenance. With these easy-to-handle tips you should have no trouble avoiding a dead battery this winter. The first step in preparing your car battery for winter (or all year) is to be aware of exactly where your car battery is located within your vehicle. Seems simple, but you’d be surprised at how many people have no clue where their battery is. There’s no shame in it! Cold winters are unforgiving. Take a good look at your car battery to see how it’s doing against the cold. A happy and healthy car battery should be clean of corrosion on terminals, present a voltage of approximately 12.4V (for most standard vehicles), be safely and securely mounted with clean connections, and doesn’t look swollen or bloated like it’s putting on some winter weight. Car batteries do not live forever. At most they will live for 3 to 5 years before they need replacement. Dealerships and places like Canadian Tire can sometimes run out of car batteries in peak winter season (it’s one of the most important things you can do for your car in Alberta), so if you wish to avoid the wild goose chase of finding a car battery in an emergency, you should stay mindful of your battery’s age. If you bought your car new, track back how old the battery is based on the purchase date. If you’ve replaced it before and can’t recall exactly when, the dealership who replaced it will have that info for you. In the event you purchased your vehicle used, it is probably best to have a dealership take a look at your battery to gauge its age and overall health. As for winter maintenance, its simple: an old and cold battery will cause you more problems than a new or well-maintained and cold battery. Did you know there are Bluetooth batteries now? This is great if you’re concerned with your judgement of whether to plug in your car or if you’re worried about overcharging. With the help of an android or iOS app, some batteries can continuously update their users with information about voltage, charge status, and temperature. If your battery is old and needs replacement, you may want to invest in a Bluetooth battery. These are the positive and negative plates that you would connect alligator clips to when you’re getting a boost (red is positive, black is negative). Identify your terminals and ensure they remain clean and dry and do not suffer from corrosion. Look to see if there is any cruddy, white, calcium build up on your terminals. If there is, you can use a wire brush, battery cleaner, baking soda and water, or a can of coke to remove this buildup. Following this step, you may choose to put Vaseline on the terminals to prevent future buildup and aid against any future corrosion. If you don’t see any build up, then you may want to add Vaseline for preventative reasons, or make a note and check again in a month. This may seem daunting to those individuals who are not used to looking under the hood of their vehicles at all. Fortunately, our technicians offer free battery testing, and can assist you in locating your car battery and providing the above listed information regarding your battery. Alligator clips on a car battery (red is positive, black is negative). Cold weather probably won’t kill your battery, but it will prevent it from working properly. When storing your vehicle for the winter, whether it’s a, soft-top or an RV, you should either unplug your battery entirely, use a trickling charger, or top off your battery monthly. A trickle charger is an electric cord with a plug and two jumper cables with alligator clips. It can be something of a luxury item. But it may be worth your while if you take short trips or retire your vehicle for the cold season. Applying a trickle charge with a low amperage for a long period can give your battery “float” voltage. This will prevent it from self-discharging. A nice low amp trickle charger will slowly charge your battery (probably the only time you’ll want a battery to charge very slowly). This is a promising option to maintain the battery of motorcycles, lawn tractor, RV, or any other 4-wheeler that retires during winter, but will be reused again in the following season. An unused battery can die faster than a recharged battery because chemicals within the battery are continuously recharging until the battery self-discharges. Even worse, a fully discharged battery can freeze, and explode if you try to revive it. Moreover, alternators cannot charge dead batteries. If you try to recharge a dead battery, you may be in some danger as it could explode. This could mean you need to buy an entirely new battery which can be a stressful and costly ordeal. Probably not a fun way to start the RV/4 Wheeler season. While you’re visiting your favourite local automotive technician, you might find that you need an oil change. Getting your oil changed regularly can reduce the amount of wear on your car battery. It can even increase the lifespan of your battery. Also, using synthetic engine oil in the winter can be helpful. They flow more easily when it is cold which reduces the amount of strain on your battery when starting up. You might hear people say, “need a boost?” or “don’t forget to plug your car in” a lot during the winter months. Fun Fact: “plugging in your car,” doesn’t mean that your battery is charging (like it does with phones). It is the engine that is being kept warm, which will help your car turn on. 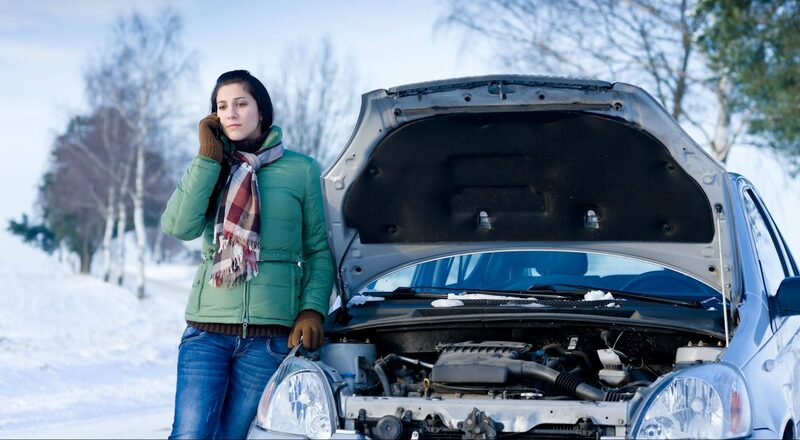 “Plugging in your car” typically consists of using a block heater or an oil pan heater. Either is a good option. The difference lies in that a block heater will warm up anything surrounded by coolant (i.e., engine). Whereas the oil pan heater will warm up the oil. Oil pan heaters will heat the oil which cools down rather quickly once it has cycled throughout the cold engine and should be plugged in for short periods of time. Block heaters (often pre-installed in vehicles and sometimes mandatory) keep the engine warm, rather than the oil. They can be plugged in for longer periods of time, making them reasonable options in chillier provinces. “Needing a boost” would mean that you use jumper cables connecting your battery to another person’s battery. Then you re-charge and “jump start” your vehicle back into action. It’s frustrating feeling, like a damsel in distress when your car battery is unresponsive. Having jumper cables in the trunk is great if you have someone around who can help give you a boost.